When you’re gaming, just a fraction of a second can make all the difference and decide whether you succeed or fail. That’s why a gaming keyboard is one of the best purchases you can make. Designed to enhance your chances of besting your competitors, Steelseries keyboards ensure that your gaming tools are up to the job and don’t hold you back. 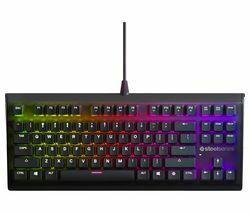 A Steelseries keyboard allows for an incredible amount of customisation, enabling gamers to personalise their setup to best suit their style of gaming. QX2 mechanical key switches deliver better performance and are highly durable, with an expected lifetime of over 50 million presses. A premium metal-alloy design ensures Steelseries keyboards are hard-wearing and suited to extended periods of play. 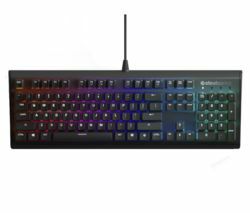 With an innovative Prism RGB multi-colour illumination system that responds to in-game events, the Steelseries keyboard offers an immersive experience that gives you the edge. Gamers also benefit from a number of programmable functions and macros, ensuring your favoured combinations are as easy as ever to execute. Beyond our Steelseries range, we also stock a wide variety of other gaming and computing products. If you’re looking for a wireless keyboard, there’s a number of excellent models from manufacturers including Logitech, Advent, and Sandstrom. With models designed for gaming purposes, office use, or basic home systems, we have something for everyone. Regular gamers may also want to view our range of wireless mice. Providing users with a little extra freedom, they’re a useful addition to any computer setup. Perfect for people that use their computers in a variety of locations around the house and those that simply want to reduce the amount of wiring around the home, they’re an incredibly useful tool.